There, I said it out loud, and I’m waiting for the moms who have it together to haul me away. I’ve stumbled onto their secrets which I’m going to share with you. Actually, it’s not a secret, it’s so plain that we’ve glossed over it. Instead, we buy books, go to seminars, ask advice, and still feel like we come up short in the patience department. I want you try a 24 hour challenge based on how we were created as moms. These SEVEN steps below may make you stomp your feet in frustration because you may already know these things, but how often do you actually do them? How often do you actually listen to your body? I challenge you to just try it for 24 hours, what do you have to lose? If anything, it will make you more aware of your needs, as well as your kids. Yep, I know so very well what happens when I try to mother three spirited kids on less that eight hours of sleep. It’s similar to when your overtired, cranky toddler, has a meltdown in the middle of the grocery isle; just multiply it times four and that’s me laying on the floor. We were created for rest. The night sky’s were meant to give us rest, to lull us to sleep with the darkness as our blanket. Our bodies crave it, it gives our minds and bodies a chance to rest and recharge for the next day. 2. Begin Your Day with God, Surrender. You have no idea what is in store when your feet hit the floor, only God knows. You don’t know whether you’re daughter is going to make you late for an appointment because of a monstrous potty accident, nor do you know how you will react to such things. Only God does, so begin each day in His presence. Surrender your day to Him, surrender your check list, your children, your words. Out of all the tips anyone can give you, this is the most important. I cannot stress it enough. Surrendering the day helps us hear His still small voice, it gives us the opportunity to parent with grace. Even the tiniest cells in our bodies crave water, they crave it because it’s how they function. When we don’t drink the full 6 to 8 glasses of water a day, the insides of our body essentially, start throwing a tantrum. We become sluggish and tired. Staying hydrated keeps us alert, most of us grab two to three cups of coffee, tea, or soda; thinking that caffeine is needed to kick that sluggish feeling. I’m all for caffeinated beverages, but keep in mind those beverages dehydrate your body. So reach for a bottled water or two after your beloved caffeinated beverage! Have you suddenly become aware of a HUGE disastrous mess, simply because your back was turned on your kids? Most of the mayhem my children have caused have been because my attention was divided. Either between making much needed phone calls and playing with the kids, or making supper while trying to listen to their requests. Be fully present, make a commitment to say, “Right now, I am just a mom.” Their primary love language is attention, and boy do they know if you really aren’t paying attention. What happens when you try to make an important phone call? Our kiddos are magnets for mama’s attention! Most meltdowns happen when I am trying to get out the door. Over time, I’ve learned to set my clocks forward 10 to 15 minutes. This enables me to be more patient while the kids are getting their socks on, turning off lights, and looking for their beloved toy that must travel with them. By the time they are buckled into their seats, we have actually arrived on time and no one is upset over being rushed, nor is Mama frustrated with getting all those little toes covered in socks and shoes! No, I’m not talking about yoga exercises of breathing, I’m talking about learning to breathe during the most chaotic moments of your day. Your child is throwing a tantrum, your other one spilled paint on the table, and your oldest wants an instant decision in order to go to a friend’s house. Stop for a moment, breathe in your frustration and urge to freak out….then breathe it out! Refer back to my previous post about S.T.O.P. and H.A.L.T. Take a deep breath and walk through these exercises to keep you from completely freaking out in front of your kids. Remember there is a bigger picture that’s hard to see in the visual chaos in front of you. 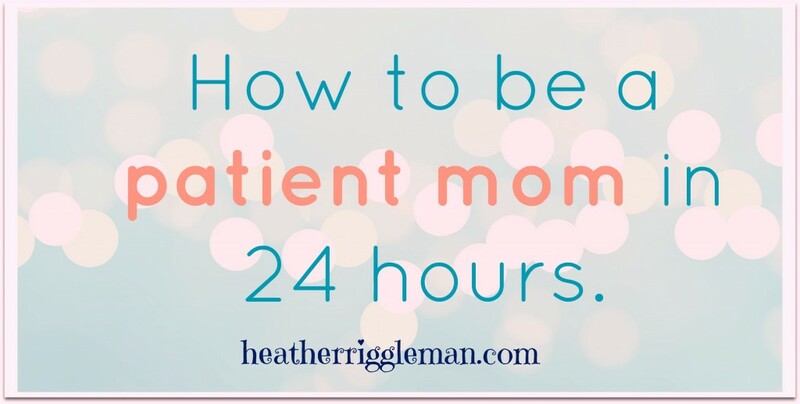 So I challenge you to try these tips for 24 hours, you’ll be a more patient mom and your kids will notice too! Try it, see what a difference these tips make and let us know what you discovered along the way. The mornings when I can’t find my car keys, Tori’s glasses and then I have to run back to the house to grab Elijah’s lunch are the W.O.R.S.T. mornings ever. It’s worth your sanity and blood pressure to do what I do. Get organized the night before. Set a schedule, have your kids boring you their planners and backpacks, get them lined up by the door and everything else laid out the night before. It makes a world of difference. This is a great post, and a timely reminder,especially as the holidays are creeping in. Sometimes we get so busy looking for "the next quick fix" that we forget the tried-and-true remedies! Thank you!! Thx for the comment, I know it's frustrating that the little things are what really helps. At least I think so. Have a great holiday Becky!